Ayantu Dadi, 20, is one of the volunteers who is helping communities protect themselves from AWD. 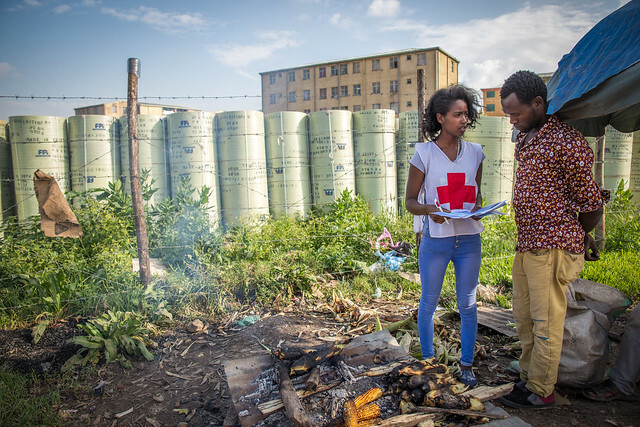 A recent college graduate and an Ethiopian Red Cross Society (ERCS) volunteer of over five years, she has been spending the last three months on the UNICEF and ERCS-supported audio truck that drives around the Nefasilk Lafto sub-city. 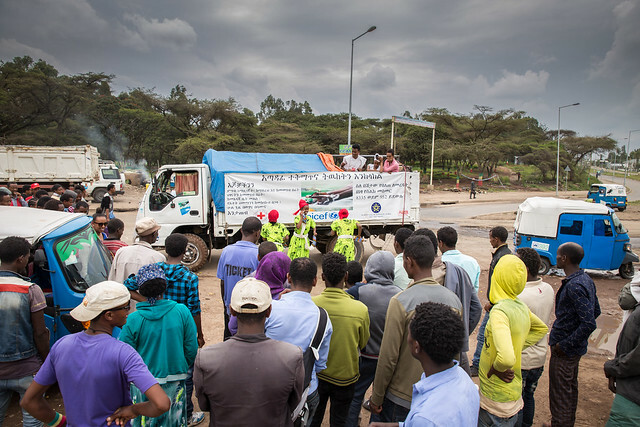 Since July 2016, UNICEF and ERCS have been conducting mass public awareness campaigns using 10 audio trucks deployed in each of the 10 sub-cities of Addis Ababa. Ayantu and seven other volunteers meet early in the morning at the Nefasilk Lafto ERCS branch office, then visit the sub-city health office to obtain instructions on the exact locations they need to cover for the day. These locations are selected based on reported cases of AWD, as well as observed risk factors such as poor hygiene and sanitation practices. The volunteers spend about eight hours reaching out the public with awareness-raising messages on how to prevent AWD and recognize its symptoms. “We play music for few minutes to attract people’s attention and then we broadcast the Public Service Announcements on hygiene and sanitation,” she elaborates. They also stop at designated priority locations, such as crowded locations where they can reach a large number of people, to distribute flyers, put up posters and have one-on-one talks with people who have questions about AWD. “We especially take time to talk with street food vendors and people in economically impoverished communities where the problem seems to be most prevalent,” she explains. According to Ayantu, the outreach helps prevent new cases of AWD as well as identify existing cases. “It is quite satisfying when you find out that your actions actually impact people’s lives. It is what encourages me to keep passing this message every day,” she says. Since the AWD outbreak was reported in November last year, 7,769 cases have been identified in Addis Ababa alone. The coordinated response by the Federal Ministry of Health (FMOH) and partners including UNICEF, cases have now continued to decline however, we should not let our guard down. Sintayehu Tsegaye 45, is among the thousands affected by AWD and was treated for a week in the local AWD case treatment centre (CTC). A mother of two, she has a small business selling potato chips, flowers and grass that is used in Ethiopian coffee ceremonies. “It is hard to be clean all the time when you touch grass all day, use community latrines and live with a big family that does not have the same hygiene practices as you,” she explains, adding that after her recovery from AWD, she has become more careful about practicing proper hygiene measures such as handwashing with soap. In addition to public outreach, UNICEF is also supporting the Government of Ethiopia’s efforts to contain and prevent the spread of AWD by providing supplies for case treatment centres, technical support for case management and infection prevention, and water treatment supplies to safeguard drinking water for households and communities.